When a laptop screen fails completely it is devastating. It can threaten to call it ‘a day’, for a long time by flickering on and off, sometimes off for about two minutes and then one day, it just doesn’t wake up again. It feels as though you have lost your right arm when that happens. If you don’t want to spend out on a complete replacement laptop, then a replacement screen is the best option and they are surprisingly easy to fit. This is not a ‘eureka’ moment, but common sense is required when ordering the part. Not every screen of the same size will fit, so you need to make sure the part you order is compatible with your laptop. If you are certain the screen is correct, you should remove the power supply and the battery and then you are ready to go. It is not quite that serious, because theoretically, you could replace your old screen, but there would be little point. To remove your screen, all you need to do is locate the screw covers and remove the screws holding the screen bezel in place. There are usually about four of these, but you may find up to six on your laptop. It is a good idea to support your laptop’s weight when you do this, although you may not worry about damaging your screen if it is already broken. You may need to give the screen bezel a little tug to remove it, but as someone whose name will remain anonymous found out, swinging the laptop around in frustration is generally because of a screw remaining. With the screen bezel removed, you should be able to see the frame holding the screen in place. At this point, the screen should simply pop out and you can remove the wires that connect it. This is not rocket science, but be careful when you are removing these wires because damaging them can be a pain to put right. One wire will be a ribbon type wire, this is used to carry the video data and the other wire is for the power. Depending on your problem, you may need to replace the power cable as well as the screen. Most of the time, it will be fine to leave the original in place. Your new screen will have a power cable if you want to replace it, but it does mean removing a couple more screws. When all that is done, it’s a simple process of putting the new screen in exactly where you removed the old one and connecting it back up. You may want to test it before you put all the screws back in because it can be a nuisance if you find you have not connected the wires properly after everything is back in place. 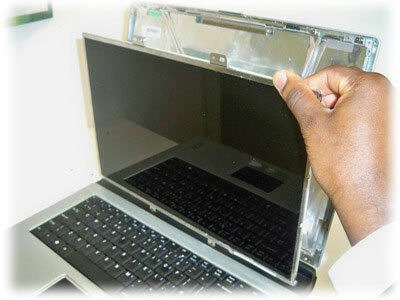 If you need to replace your laptop screen, take a look at www.accupart.co.uk, they usually have a screen to fit for a decent price.